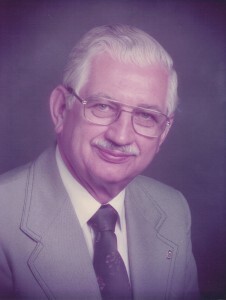 Andrew J.”Andy” Donick, 89, of Warren, PA, died Thursday, February 23, 2012, at his residence. Born October 5, 1922, to the late Michael and Mary Staryak Donick in Sheffield, he resided in the area his entire life. Andy was a 1940 graduate of Sheffield High School and served in Europe as a U.S. Army Tech Sergeant during WWII. He was employed with the PA Bureau of Employment Security for forty years, retiring as the local manager in 1982. He was a parishioner of St. Joseph R.C. Church, where he was active for over sixty years. He served as one of the very first lectors at St. Joe’s and continued in that role until long after his professional retirement. Andrew was a Fourth Degree member of the Knights of Columbus. He was a life member and Past Exulted Ruler of the Warren Elks Lodge 223, a fact well known by all who recognized the “ELK PER” on his car license plate. He was a life member of the Warren Eagles, a member of the VFW of Warren and Sheffield and the American Legion Post 135. A man dedicated to the community, he served on the committee to help establish and build the Warren Co. Vocational Technical School. He was active in the development and leadership of the Warren County United Way. He served on the camp committee of the Warren YMCA and in countless other community organizations. He took particular pride in having assisted in the fund raising that built the St. Joseph R.C. Church on Pennsylvania Avenue and he worked tirelessly to promote St. Joseph School. In his older years he was well known about town and enjoyed all he came in contact with. Andrew Donick is survived by two sons – Dr. Mark Donick and his wife, Karen, of Warren, and James Donick and his wife, Caroline, of Pleasant Valley, NY; a daughter – Anne Donick and her spouse, Sara Ford, of Lewes, DE. ; a daughter-in-law Janet Donick of Scotland, MD; two brothers – George Donick of Cranford, NJ and Paul Donick and his wife, Yvonne, of Escondido CA; seven grandchildren; four great grandchildren; and many nieces and nephews. In addition to his parents, he was preceded in death by his wife, Elizabeth Splain Donick on November 13, 1979. They were married April 26, 1947 in Oil City, PA. Andrew was also preceded in death by a son – Andrew Joseph Donick, Jr. on October 8, 2005; brothers – Michael and John Donick; a sister – Mary Ann Croman; and his long-time companion – Mary Christy, who shared his life for 20 years. Friends may call at the Donald E. Lewis Funeral Home, Inc. 304 East St, Warren 16365 on Monday February 27, 2012 from 2 pm to 4 pm and 6 pm to 8 pm where a vigil service will be held at 3:45 pm with Rev. Fr. Richard J. Toohey, Pastor of St. Joseph R.C. Church. Members of the Warren Elks Lodge 223 will conduct their ritual at 7:45 pm. A Mass of Christian Burial will be conducted at 10 am Tuesday, February 28, 2012 at St. Joseph R.C. Church with Rev. Fr. Richard J. Toohey, Pastor, officiating. Interment will follow at St. Michael’s Cemetery, Sheffield where full military honors will be exercised by members of Clarendon/ Sheffield VFW and U.S. Army personnel. Memorials may be made to St. Joseph Church Educational Center Fund, 600 Pennsylvania Ave. West, Warren, 16365. Online condolences may be offered at www.lewisfuneralhomeinc.com. We have known each other a long time. I am sorry to hear of your father’s death, as we are always too young to lose our parents. It do older, just cherish all that they did do for us…. my heart breaks for you. Your father always treated me so nicely, when I was growing up. We send our deepest sympathy to you and the entire family. Your dad sounded like a wonderful guy, and we hope that great memories will help to ease the loss and warm your hearts throughout your lives. Truly sorry for your this loss. Uncle Andy raised a beautiful family. He lived a life that few can measure up to, and that all should aspire to. My prayers are with you all. I am so greatful that we had all the previous Februarys with Uncle Andy and Mary. He will be missed. Your father was a wonderul man with a rich life. Always friendly, always kind. In this time of mourning, I hope you can also celebrate his life with great memories. The proof of his good character is the character of all of you. Take care and my thoughts are with you. Uncle Andy was a wonderful man! I remember stopping at his house on the way to or from Aunt Mary’s in Great Valley. He will be truly missed by all that knew him! Thoughts and prayers are with you! It’s hard to believe that it’s been over 3 decades since I first met all of you and “AJ”. Your father was a wonderful man and I have fond memories of the many, many hours I spent at your house when I was living in Warren. He was so kind to me and I will always remember him. He was very proud of all of you and loved all of you so much! I know that it will be hard going forward without him, and you will all be in my thoughts and prayers. Your dad was a wonderful guy with a great heart. He always had that twinkle in his eye. I will always remember how he treated us like a member of the family when we visited. He will be missed. Our sympathy in the loss of your Dad – he was a great man. May you find comfort in your memories of him. So sorry to hear of your dad’s passing. I think my mom and I saw him the last time I was in Warren and I took my mom to the Peppermill for lunch. Your family was always very welcoming. Lots of memories. Take care all of you. You have my deepest sympathy. Your Dad was one of a kind. Kevin always had good things to say about him.